A Celebration of 100 Congresses! 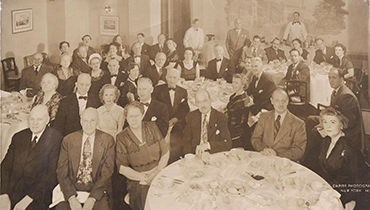 On December 14, 1948, the International Society for the Performing Arts (then known as the National Association of Concert Managers) held it first congress at the Hotel Woodstock in New York City. Almost every year since we have gathered in New York. In 1987, under the leadership of Geoffrey Butler and inspired by Joseph Golden, ISPA held its first mid-year congress in London, England. These two annual congresses have become the hallmark of ISPA and have forged countless collaborations, ideas and friendships. My first ISPA congress as a member, not staff, was Hong Kong in 2006. It was a transformative experience for me as I learned about an arts convening that discussed ideas and celebrated diversity. My community building partner was George Trudeau and at the new member lunch I sat with George, Benson Puah, and Graham Sheffield. As a producer of a touring company at the time I thought I’d died and gone to tour promotion heaven but quickly realized ISPA was about something much more lasting. That first congress I met so many people who would become an important part of my career and life. Many fond memories of that first congress include Liz Bradley, Maria Hansen, Margaret Genovese, Marie-Catherine LaPointe, Robert Gilder, Charlie Cutts, Marty Jones, Tisa Ho and many others! Thank you to ISPA’s members for embracing a (relatively) young arts administrator from Toronto those many years ago and still today!" I participated in an ISPA Congress for the first time in 2013, in New York. It was also my first visit to New York City. I was working as the assistant director of Istanbul Theatre Festival since 2005 and I had taken the direction of the festival at 1st of January 2013. I already participated to international arts markets in various cities. But to participate ISPA was very important for me because I met with many promoters, managers during the congress. In general we have very good contacts with European institutions but ISPA has offered me to meet with overseas institutions, companies and artists. I also very appreciated the panels organized during ISPA Congresses. But most important opportunity for me was the invitation as the speaker for Regional Update part in 2015 to give the information about Turkey and cultural life in Turkey. I hope we can have more opportunities in order to share more about the performing arts scene in Turkey, especially in Istanbul." CEO, The Esplanade Company, Ltd.
At the last New York Congress I was busily introducing myself to new delegates and was often asked if I had attended many Congresses. This is such a wonderful sign of renewal that gives much hope to an ‘old timer' like me that the next generation of leaders has arrived! This would not have been possible if not for the passionate leadership of our CEO David Baile, guided by an able and committed Board and hardworking committees. As we celebrate our 100th Congress, I pay tribute to those who have served and are currently serving, who have laid the solid foundation for ISPA’s success. To Elizabeth Bradley, Graham Sheffield, Martha Jones, Susan Stockton, Anthony Sargent and present Chair Mary Lou Aleskie, my heartfelt thanks for building this fantastic institution for all of us. The best is yet to be!" As we approach our 100th ISPA congress, I'm reminded that I've been fortunate to attend over half of them -- 55 to be exact. My first was the New York conference in December 1986, six months before I began my job as president of UMS. It was especially memorable because I had not been engaged in the presenting community previously and was meeting for the first time people who would become cherished colleagues and friends from all over the world. I now have a network of ISPA colleagues in São Paulo, London, Hong Kong, Singapore, Amsterdam, Toronto, Bogota, Wrocław, Sydney, Zagreb, and virtually every other ISPA host city. And now we will add Montréal as our 100th! As I think about ISPA congresses of the future, I want to encourage all longstanding members to reach out to new members and first-time attendees. Make a point to welcome them and introduce them. When you think about it, each ISPA congress represents a moment in time where hundreds of people have chosen to come together in the same place at the same time from all over the world. My hope is that ISPA can become for every new member as professionally rewarding and personally enriching as it has become for me in my first 30 years of membership." I had a career transforming conversation with Benson Puah at the Sydney congress in 2001. I was really struggling with the twin demands of running a performing arts building and, at the same time, carrying out a major building project on a separate site. I had reached the conclusion that I wasn’t skilled or resilient enough to be successful in these tasks and would have to look for a career elsewhere. With just a few kind words and the useful perspective of an informed outsider, he made me see that the job was complex and would challenge anybody whatever their experience. Benson gave me encouragement and the confidence to carry on, resulting in the successful transformation of Glasgow City Hall and the iconic Old Fruitmarket. I just love making new ISPA friends and carrying on catch-up conversations with old friends from congress to congress. There’s always someone who knows exactly what you need to do or can signpost the right expertise. I really enjoy the international congresses where you get to see a country through the eyes of the people that work there. This is a unique opportunity which I very much value." In our field of work there are several national and international societies within music and art performance and we do not have the time or the economy to be a part of them all. Some years ago several colleagues and friends mentioned the organization and network of ISPA; some years passed before I finally attended an ISPA congress in New York and YES! I was immediately hooked and wondered why I hadn't attended earlier. ISPA is important both for the development and status of the arts as well as for each and everyone in this field on a personal level. The thing is that it is not a congress where you primarily ”buy and sell”, although you can do that as well – directly and indirectly. It is foremost a possibility to get wiser, acquire inspiration and knowledge, start collaborations, discuss experiences and provide energy that recharges us and which we take home with us to our daily lives and work. Spend and bring a little of yourself and you will get so much back." ISPA kept its promise of integrity and lived up to its welcoming reputation: I encountered in every interaction at the NY Congress generosity of spirit and a genuine value given to each individual’s contribution to the vibrant evolution and progression of our international cultural communities – ISPA is a place where leadership is recognised and understood intimately. As part of the Seminar day, it was inspiring to meet such an eclectic and international cross section of the culture sector - 56 voices all taking responsibility for their role in making positive and responsible change through art and culture across a wide-reaching set of locations and geographies. My key takeaway theme, brought into focus by the recognition given to complex identities be it first nations, dual national, migrants is, succession planning and succession mapping in order to take forward my further informed thinking on leadership by being at ISPA. The 100th Congress is in Montréal and the theme is Identities – my ISPA Community Building Partner is Marie-Christine Dufour from Lemieux Pilon 4D Art and it is was her underlining of the nuance that the theme is not Identity but Identities. I am drawn to this deeply as I have a particular focus in my work on evolving intersectional identities and how this informs and impacts our workforce, spaces and places, and ultimately our cultural expressions across art forms and in our museums." Take a look at Nazli's congress experience through her blog. In mid-1960 as a manager, I constantly heard from presenters that I "'didn't understand their problems" in booking my chamber music clients. The Dorian Woodwind Quintet was considered 'esoteric'. The top fee for the Juilliard Quartet was $750. I subsequently started the Concert Party series in New York's Biltmore Hotel as an experiment in audience development. We had to move each month to larger spaces. Patrick Hayes invited me to join ISPA which was then only for presenters, and in either 1968 or 69 I was asked to program the annual meeting. I can't remember the panelists from the three major TV networks for the session regarding the lack of classical music on TV. The Westinghouse Hour every Sunday evening was not being renewed. It was quite a heated discussion...performing artists weren't interesting to look at on TV, etc. However, it was announced a few weeks later that the three networks would support a new channel, and PBS was born. The other session was moderated by young pianist Lorin Hollander, the panelists were senior high school students from various schools in the three boroughs. Lorin wore an all leather outfit which symbolized the rebellion era just beginning with teenagers then. Some ISPA members were offended by this. It was hard to stop the discussion, however. We used this group of teenagers again for their impressions in the beginning years of marketing! After some hot criticism for 'marketing the arts' as crude and vulgar, I was pleased two years later when I arrived for the ISPA congress to meet the marketing director of the Metropolitan Opera! As you can see, our conferences were looking inward at that time. As a European member of ISPA, I lobbied for meetings there since common problems existed. Joe Golden was the first president to take this seriously and we went to London first. The rest is history."